World, meet falafel. Falafel, meet your eaters. This recipe really threw me for a loop! But after multiple rounds of testing, I believe it’s perfected and ready to be enjoyed by all of you. I’ve made two other falafel recipes for the blog. First were my Better Than Restaurant Falafel, which still rank up there as one of my all-time favorite plant-based recipes! And last year I made these Baked Falafel Burgers, which are all kinds of hearty and delicious. But I was still craving something a bit more traditional. And since I eat falafel so often at restaurants, I wanted a recipe I could make at home and really enjoy. I believe I’ve gotten as close as humanly possible without busting out the fryer – a feat I have yet to attempt. 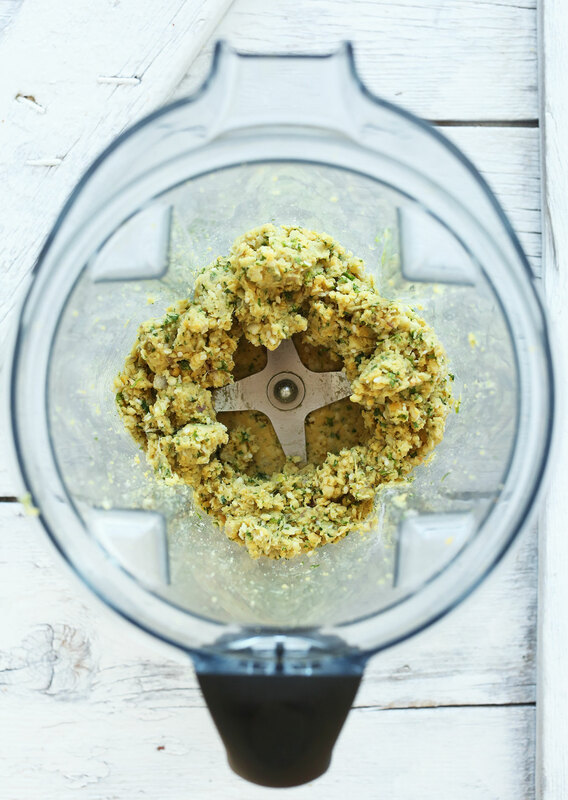 These falafel are simple, requiring just 10 ingredients (give or take a spice), and come together in a blender or food processor. They also sauté up beautifully in just 5 minutes! The only waiting period is 1-2 hours for chilling the dough (which is optional but recommended). Otherwise, these little gems come together with minimal effort and time. What is a falafel without a good sauce? My 4-ingredient garlic-dill sauce is not to be missed. While your falafels are cooking, whip this up in just 5 minutes to elevate this dish to the next level of awesome. Trust me on this one – you’re gonna want that sauce. 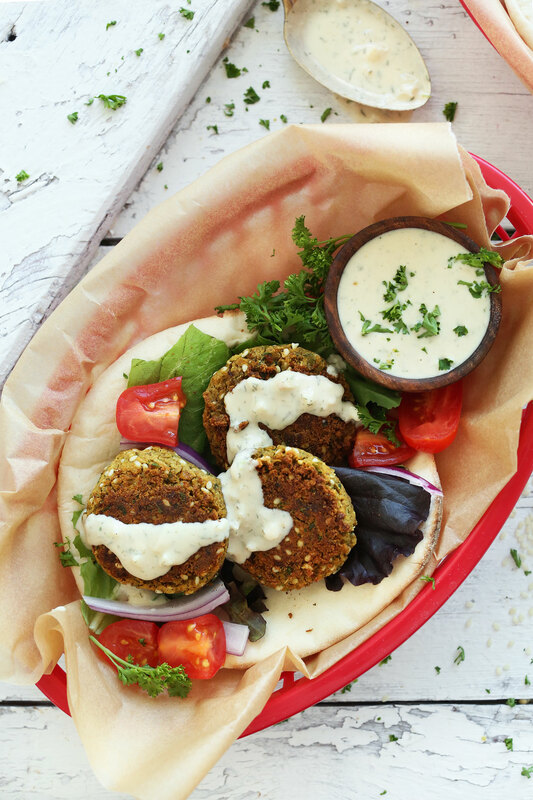 Who needs take-out when you can make perfectly delicious falafel at home? Serve these in a pita with tomato, onion, lettuce and my garlic-dill sauce and you’re seriously good to go. Hummus and vegetables make an excellent side dish. Otherwise, serve these atop a bed of greens for a lighter option. If you make this recipe, let us know! Leave a comment and rate it, and don’t forget to tag a picture #minimalistbaker on Instagram so we can see. Cheers, friends! I work in a group home and my primary job is preparing meals, and of course healthy meals. These guys are used to eating meat with every meal, and no one really cared to nourish their beings with the foods they prepare for them. THIS RECIEPE HAS BEEN SUCH A HIT! Thank you so much for curating this blog full of wonderful nutritious recipes. So grateful xoxoxo. THANK YOU SO MUCH, DANA! I had lost my falafel mojo, until I found your recipe. Your recommendation to obtain the right “texture” was critical to my success. I backed off on some of the seasonings, I cut back on the garlic a bit, and I didn’t use the panko, but I LOVED these. And I realize that as long as the texture is good, then the flavor profile can have some flexibility. I used 2 heaping tablespoons of Bob’s Red Mill GF flour mix, and it was the perfect flavor for the falafel. I am putting these into my regular rotation! Thanks for this fantastic recipe! So glad to hear it, Melissa! Thanks for the lovely review! Just tried this, and it was super easy and delicious as a salad! A definite go to recipe for texture! Works well with creamy vegan dressings if you aren’t up for the calorie hot that tahini packs. This one will go with me for long weekends, and summer dinners! If I am making tgem for an Israeli style brunch, serving 30 people, how many falefel should I make? Hi Reyna, the recipe as written makes ~12 falafel and we would suspect you to need about 2 falafel per person- so perhaps 5 times the batch. Hope that helps! How will it turn out if I used rice flour instead? We haven’t tried and can’t say for sure, but if you experiment with this recipe, report back on how it goes. Good luck! Wow! I have been making the same falafel recipe for like 7 years and I decided to try this one instead and I liked it so much better! A few changes I made: I added more parsley (mostly bc I just chopped too much, but I liked the green color it gave the mix), and I baked the canned chickpeas at 350/375 for 15 minutes beforehand to remove excess water. This actually made the dough a better consistency and I didn’t even need to add flour. I have just an Oster blender and no food processor, so I mashed the chickpeas with the bottom of a glass first, and stirred them together with all the other ingredients before putting in the blender. I also threw a small amount of white beans (unbaked) in at the end because I needed to use them up. Then I baked them instead of frying them (for 25 minutes at 350 F) but they did seem a little dry after baking them. I think they would have been a perfect consistency for frying though. This recipe fell apart on me when I tried to pan fry them so I coated them in oil and baked them off with much better luck. I will make again but with a flax egg to bind. Great flavor! I just made this in the air fryer- a spray of canola oil and 10 minutes at 370- pretty delicious! Thanks for the recipe! I have a garlic and onion allergy. Do you suggest substituting anything if I omit them? Great recipe and a keeper! As a confession, I’ve had some bad luck making falafels – they’ve been too dry, too dense, too heavy, or lacking flavour. Made these on a whim for a friend visiting from out of town – and I took a chance to make falafels (without even trialing the recipe…eek!). I’ve made a lot of food with other recipes by Minimalist Baker which has never failed me. I put my trust in once again…and of course rendered wonderful results. They were easy to make, straight=forward, and no surprise ingredients. Hearty but not heavy, while very robust in flavour! My friend who is vegan loved them and my boyfriend kept raving about them. I served these with hummus along with an avocado-chilli sauce which were perfect compliments to the falafels. Thank you for restoring my faith that I can make falafels and providing once again another wonderful recipe! I’ve made many felafels in my lifetime, but this is by far my favorite! I used spring onion in place of shallot, and cumin seeds in place of ground cumin. Will probably leave out the sesame seeds next time as my blender left them whole. I didn’t have time to rest mixture as 4 yr old was “starrrrrving”. Will also cook longer on lower heat as the outside was crunchy but inside moist. This recipe looks amazing! I can’t wait to try it. My question is, I do not use oil, is there something I can recommend in its place? Thank you! Hi, this was so tasty!! i have been vegan for 3 years and since i found your page i just know doesn’t matter what i make it will be good. No more trying recipe out before some big dinner e.t.c. Thank you so much for all your work. Me and my family have never been let down and are always happy to discover some new recipes. This was awesome! I used 1/2 an onion and was so glad she recommended taste-testing: way too oniony! So, I just sprinkled more of each of the spices and extra sesame seeds and flour. They turned out great! I used a GF flour blend and that worked with no problems. It did have xantham gum included so that might have made a difference. I am egg free right now and having a falafel tonight made my day. I made the dough and it’s super sticky. I drained and rinsed the chickpeas. I added like half a cup of flour and it’s still super sticky. No way I can roll them into balls. I followed the recipe and used fresh parsley. How do I get it dryer?? Hmm I’d add more flour and pulse/mix to combine until no longer wet and you can mold the dough into a ball without it sticking to your hands. Hope this helps for next time! I made a second batch and I put the chickpeas in the oven until they were very dry – almost roasted. That worked! I only needed about 4 tbs of flour. This is the first felafel recipe I tried and I can stop looking now! They are amazing! I used fresh dill in the garlic dill sauce and it came out super delicious, and can also be used as a salad dressing. I’m new to being vegan and I’m so happy I found this. I will probably double the recipe next time and freeze some for an easy addition to salads, wraps, on a tasting plate or along side veges. They are already a favorite in our household! Hi. I am blown away by all the positive comments on this recipe. I’m going to try it tomorrow. Just wondering if you have any suggestions on cooking it in an air fryer. Should I brush a little oil on it before putting them in the fryer? Thanks. Hi Skip! We haven’t tried making these in an air fryer, but if you experiment with it, report back on how it goes! Good luck! Followed the recipe, no changes, yummy! Crispy outside and very soft inside. Any way to make it less soft inside, with some more consistency? Anyway, hubby and I loved it with hummus and veggies. Just a pity that the kids didn’t appreciate it. For those readers looking for a review from someone who actually made it… here you go! These were absolutely delicious, definitely the best falafel I’ve ever eaten – and I’ve had my fair share of falafel shawarmas! We added a bunch of spinach and chili flakes to the blender and they turned out an amazing green and were super tasty. I probably added more than 4 tbsp of flour in the end, but they stuck together really well. Thanks so much for the recipe, it’s going straight in my special favourite recipes book! I was introduced to this recipe by my son who is vegetarian and I just loved them. When I have tried to make them before it was too time consuming so thought he put a lot of effort into the dinner. Come to find out how simple it was. I have made them with good results several times, eating them fresh and freezing them for a month or so, very lightly browned. I then thaw in fridge day of event and baking further to brown and heat (brush with olive oil -375 deg for about 10-15 min flipping them about half way through). If they are a little dry when making the balls and don’t stick I will put in a drop of sesame oil and a little water into the mixture. The sesame oil increases the sesame flavor too if you are using other nuts. – a drop is all you need. I have also played around with the spices but really like the cardamom and coriander. Panko crumbs give a nice toasty coating but don’t always use them. Great recipe! Would you be able to sub all purpose flour with almond flour? I’d recommend subbing with oat flour or gluten-free blend with varied results, which will give you more success than almond flour in this case! I love falafel and always looking for different versions to try. I haven’t tried yours yet but I am curious to find out how adding flour and cooking with avocado oil enhances the flavor of the falafel, this sounds interesting. Look absolutely divine and it’s going on my weekly chart immediately. My only question, do you think this would be fine to make even a few more our earlier to rest in the fridge? Say in the morning before work so they’re ready to cook off once I get home? Many thanks from now, and for sharing as always! Yeah that should be fine! I tried this recipe last night and it was the bomb! Straight up forgot the sesame seeds but it was delicious without it. Love all your recipes. These look delicious and I’m planning to make them tomorrow. Do you think the mix will be ok if I make it tonight and refrigerate overnight before making it into parties and cooking? I made these and they were a big hit with the fam! Planning on making them on vacation. I see that they can be frozen but are better fresh. Would it be a better idea to freeze once molded and then defrost on vacation and cook them there? This recipe was amazing! I made it exactly as the recipe stated using fresh Italian parsley and adding cardamon and coriander. I served it on Naan bread because that’s all I had at the time with lettuce and tomato. I already had a vegan ranch sauce on hand so I used that. My non-vegan family loved it as well. I’ll be making a double batch next time so I can freeze some for later. USE the water from the chickpeas (Aquafina) as a natural thickener to make vegan mayo just add lemon juice and black pepper/salt to about 1/2 the liquid in a jug, mix then slowly add about 15fl oz of rapeseed oil whilst blitzing with a hand blender. Chill for an hour or 2 and it will thicken slightly. Hi there, E here just wondering what containers in the picture you used? Trying to find a way to serve these to my teens that will make them eat it. Thank you! P.S. Great recipe I use it all the time! Hi Dana! Linda here on the island of Grenada on my boat! This was easy to make in my tiny kitchen and so tasty with local greens and avocado! I had to substitute “wild big thyme” for parsley / cilantro because their wasn’t any available in the grocery store. My carnivore husband even likes this! Thanks! This was just exceptional. Easy to follow. No surprises. Extremely tasty. I can’t be more complementary. I’m getting my feet wet with vegan and this is just the ticket! Keep up the fabulous work!!!! I just made these tonight! I followed the recipe pretty faithfully except I doubled it for my family of 6 and added shawarma spice. They were delightful delicious and de-lovely. I served them with Greek salad and yogurt-tahini sauce (I’m vegetarian not vegan). Thanks for the yummy recipe! Yum!!!!! I made it and it was absolutely delicious! Amazingly deliciousness! Thank you for a great recipe. Zero leftovers, ha! And super easy to make. A good recipe to prep in the morning and quickly cook the patties just before dinner. You know its a good recipe when there is no leftovers :D Glad you enjoyed! Do I cook the chickpeas first? We used canned chickpeas in this recipe, so no! But if you were to use dried chickpeas, you’d want to soak them first. I seem to be struggling with making falafal! This is the 4th recipe I have tried , and whilst it has been the most successful so far , they always seem to fall apart at the cooking stage. Next time I’m going to try making the patties thinner, but I’m starting to think deep frying is the only way to go to get that crispyness. Very flavorful. I let my dough sit covered overnight which might have dried it out too much as it did not want to stay in a ball. So we ended up with falafel hash. The garlic dill sauce was a great addition. The panko adds crunch, but the extra work after making those little balls was fiddly. Also put on the tabouleh with some minced radish for extra crunch. Soooo I think I did something wrong but I promise I followed the recipe… I put mine in the pan and they instantly turned to mush I left them in the fridge for two hours and crumbed then too and they still turned to mush……:( what did I do?!?!? Hi Ashley! I am wondering if you may have put too much oil in the pan? This has been an issue for other readers, which is why I wonder if that is the case for you as well. Just tried them and they are lush! And you are right the dip goes perfectly with them. So easy! Thanks for this recipe! I added green onions and had roasted garlic on hand i used instead of raw. I was out of pita , so just warmed up tortillas! Delicious. My 1st attempt at falafel, so glad I did it! These were so yummy. Everyone loved them. I’ll definitely make them again. Made this for the first time last week and making it again tonight! Super easy and delicious. I used pecans and white onion because that’s what I had and it turned out great. My kids loved them too. Thank you!!! Hi, I’ve made these before and LOVED them! Yes! Freeze to keep fresh for up to 1 month. My husband always pokes fun at my for my attempts at healthy eating. He didn’t know what falafel was and while watching me make these said “I see you mashing up beans in there – I like MEAT! Paired these with the garlic dill sauce and topped with fresh chopped cucumber, tomato, pickles, olives and red onion and he said, “Those were actually delicious. 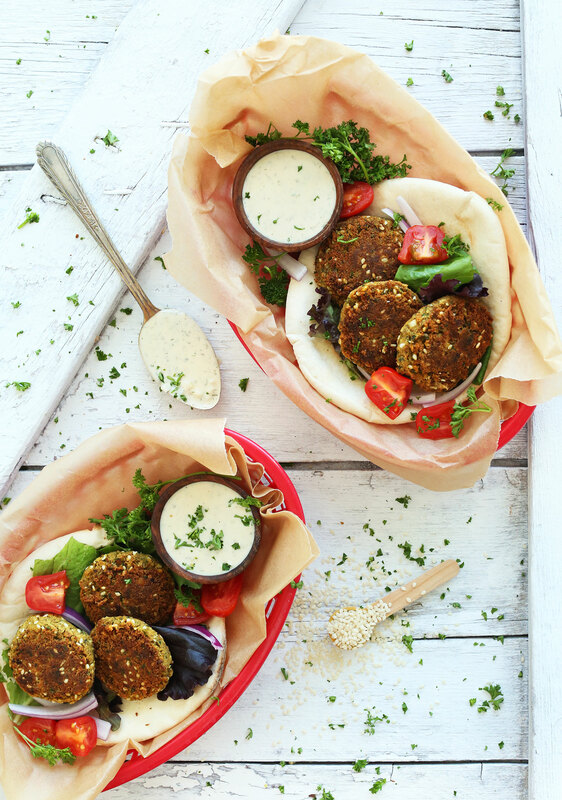 I’d eat those anytime.” Huge win, will be making these again and don’t ever see the need to look for another falafel recipe as I’ve found the winner! Thank you! This was a perfect recipe for a falafel! Mine turned out amazing! I followed the instructions step by step and did not need any modifications. I made some of them with Panko crumbs but I liked the ones without them better. They brown up perfectly and stay together without cracking. Thank you for this recipe! Amazing Dish!!! It’s too delicious. Thanks for sharing with us. I made this falafel this week and YUM! Mine were a little on the green side because I used an entire bunch of parsley. I found this super easy to make, even though I admit I was a bit intimidated before I started. I started the prep early in the day in order to not feel overwhelmed with the many steps. I found that it made about 5 small falafels and 15 large ones…but there was no way for me to stretch it to 24. I Highly recommend this recipe! So much fun to make and equally delicious! The falafel mix kept great in my fridge for almost 5 days. I was able to enjoy falafel all week- best week ever! Spice mix is on point! Definitely suggest throwing in fridge before cooking and using the panko breadcrumbs for extra crunch! I added pickled onion and cucumber salad + hot sauce on my pita- so so good! Also that dill sauce is a must! I made extra and not a drop of it went to waste. I don’t have a food processor. Can I just mash everything together real well with a fork you think?? Hi Estela! We highly suggest using a food processor or blender, as it may not mix well by mashing it with a fork. If you give it a try, let us know how it goes! My favorite preparation for falafel. By far. This smelled great as I prepared, as it cooked and then I couldn’t resist. Oh so good! I love these. So much! I like this method more than the dry soaked chickpeas method. Mmm. This recipe is a keeper! This is delicious both as a sweet pancake and as a savory one. I made this just for a change of pace but I loved it and will continue to make it. Adding fresh herbs to it is fantastic without the sugar is phenomenal. Just great. Oh my. It was all my husband and I could do not to finish off the batch in one sitting. Served over a cucumber-tomato-red onion-quinoa-parsley-dill salad with garlicky silk tahini sauce. First time making falafel, won’t be the last! We are two months into our plant-based diet – you are making it a breeze, Dana! My kids love falafel or anything that resembles burger patties. As we’re testing out vegan waters, I think this a perfect dish to let them get used to and enjoy plant food on a daily basis. I’ve already tried your hummus and vegan cheese variations and loved them all. I’d like to make this dish a bit spicier, maybe add some paprika and za’atar to the batter. Zaatar herb with hints of thyme, savory, marjoram and oregano would give this a perfect middle eastern touch. Although, zaatar is now easily available everywhere, the quality of mixes varies a lot. Most in the market contain fillings like wheat, or even citric acid in place of sumac, and importantly low quality and less amount of the zaatar herb. If buying online try sourcing from eatzaatar, or search for quality Za’atar, Za’atar with no fillings, pure Za’atar, or zaatar no salt. Ok so for those of you figuring out the vitamix, I found a few tricks to help out. Number 1, the chickpeas have to be very very dry. Drain and rinse, then ignore them for an hour or two. Second, blend chickpeas first without any other ingredients for just a few seconds. Scrape out the chickpea batter (should be the texture of oatmeal and mince the garlic and shallot and cilantro and toss in with the batter. Add spices and then flour one tablespoon at a time until the batter doesn’t stick to your hands. Doing the chickpea separate from the aromatics and making sure they are very dry made all the difference for me. First time I made this recipe I hated it. This time I LOVE it! OMG, these falafel are soooo good! And really easy. The cardamom is a brilliant touch. Thank you! on instruction number 10, the link for garlic-dill sauce takes me to a recipe for intermediate baked sweet potato. It’s the “Garlic Herb Sauce” within that recipe. I just made this for 2 native Israelis and the pronounced it as the best falafel they ever had – that is saying a LOT. Thanks for the great recipe. Can this be made the day before and left overnight in the fridge before cooking? Yes, I think that would work Megan! Can these be baked instead of fried? I’m trying to cut out oils. Thoughts?? Hi! It should work, you could also try omitting the oil and use a non-stick pan instead! Excellent recipe and sooooo easy tout do! Thanks! Hi Dana, Your simple recipe looks very nice and taste.Thanks to share your vegan falafel recipe. Hold on! Isn’t falafel vegan to begin with? I’m talking the traditional recipes used in the Middle East. Recipe seemed easy enough to follow. They tasted great but did not get crispy at all. They stayed mushy even after frying them. Have no idea what happened. This was my first attempt at falafel and I don’t know if I’ll try them again which is a bummer because they are my boyfriend and daughter’s favorite. My second time making them. My daughter always loved falafels and she said this is the best recipe ever. First time I left them little bit chunky and I like that way much better then smooth dough. I also added 1Tbs of smoked paprika. Don’t ask me why, I just put paprika everywhere. Thanks for sharing. I love your recipes!! This blog is the go-to site for my roommate and I, and we’re making something from here at least twice a week. :) I just wanted to comment that I was able to adapt this to work with tahini and some hummus instead of the sesame seeds, and that baking them works as well – 350F for about 15 minutes! dude these turned out INCREDIBLE, i can’t wait to make them again! i used fresh cilantro instead of parsley. i made a vegan tzaziki and the combo was out of this world. i’m hungry just thinking about how great they were! thanks for this bomb recipe! what are your thoughts on using dried parsley? I have all the ingredients on hand except for fresh parsley! Go for dried if you’ve got some, Noelle! thank you very much. it is a second recipe I try and it is amazing. I had such a hard time finding the right recipe. I am allergic to gluten and can not eat falafel out. we were close to giving up on it, but I love love falafel so gave this one a try . it , finally, worked! many thanks. have to try your Persian chicken (I think I will do pieces though) and shakshuka. I made these last night and they came out perfect! A couple of changes: I used three scallions in place of the onion, and threw in some turmeric and curry powder for seasoning. Also, I used a lot more oil for frying so they were probably not as healthy, but super crunchy and delicious. After having read many recipes – and many that insisted you had to use dry chickpeas soaked over night – I was so happy to have this recipe turn out so well using canned chickpeas. 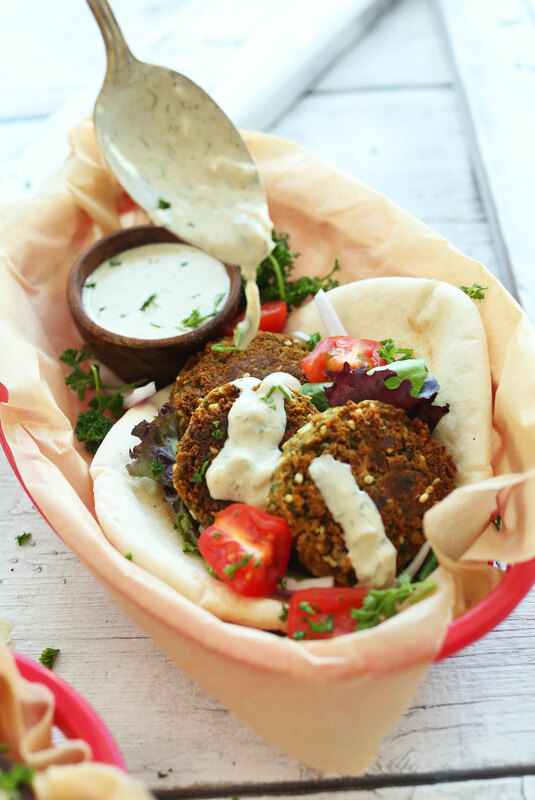 Cause sometimes, you want falafel tonight! I love falafal but never thought I could make it decently at home. This recipe has changed that! This was so delicious and very easy to make. I didn’t have all the optional spices, so I added 1/2 tsp garam masala for some extra flavours as well as adding gluten free flour which worked great. Again going gluten free I omitted having a pita and served it up salad style with the falafal on top. This recipe has already become a favourite! Thanks for the love, Karen! Seriously! This recipe is so delicious that I made it twice this week! I used cilantro, simply because I have an abundance of it. The aroma while these little beauties fry up is incredible. I served the falafels with homemade flat bread, a Mediterranean salad, hummus with baby carrots & a drizzle of vegan tzatziki sauce that I prepared earlier…happy family. I will be serving these with your garlic dill sauce next time. Thank you for another wonderful recipe. Just had this for supper tonight. Both my husband and I raved about them. That Garlic-Dill Sauce was so easy and so lovely. Thank you, thank you, thank you! Which of the five falafel recipes do you recommend the most? Can I make this without cilantro or parsley or any fresh herbs. I don’t have any on hand. What do you do when they start to fall apart in the pan? These falafel are amazing, even my non vegan mom fell in love with them! I used cilantro because I love its flavor and instead of all purpose flour I used 4 tbsp of oat flour and the batter came out great! Once againg thank you for another amazing and delicious recipe! Lots of love from Puerto Rico! Just made these and they smell amazing! However, they were incredibly crumbly, and if I`m not very careful when I touch them, they fall apart completley. Is this because I left out the flour (didn`t add it because my mixture had a good consistency without it)? Hi! Yes that could have been the reason that they crumbled! The flour acts as a binder and helps them to stick together! Better luck next time! hello. Do you think these could be made with soaked chickpeas instead of canned? Or will I need to cook them first? Just soaked a whole pound. Haha. Lots to use. Hi Abby! I recommend either using canned or cooked chickpeas! I live for falafel but like everyone else I don’t always have the time or energy to make the effort. Thank GAWD i found premade frozen falafels that are actually really good. I buy the Tadah falafel wraps (its like a falafel burrito) and their falafel poppers. i keep them stocked in my freezer and just heat them up when the craving hits. At one point I was eating one everyday. Nothing beats freshly made falafel but these guys are legit and have saved me from going falafel-less. Hello, can these be made day before and kept in the fridge? Thank you for sharing this recipe – I made the falafels and the Dill-Garlic dip – they came out sensational!! Very tasty and the instructions were so easy to follow! I made these tonight and they were the perfect consistency. I did add a squeeze of lemon and used 2 Tbl emmer flour and 2 Tbl rice flour (because that is what happened to be close at hand). No problems sticking together. I even actually just threw everything in the blender together (including the flour) and then blended until it kind of came together. Oh yes, I added some garam masala (again what I had). Easy to work with and tastey. Thank you! My new go-to falafel recipe! I just made these for dinner tonight. They were absolutely delicious. I added a generous pinch of chilli, as we like things spicy, but left everything else the same. I didn’t have any breadcrumbs, so I coated with a thin coat of semolina, which made the outsides nice and cruncy. I will I had made double the amount, though there are a few left tomorrow, to pick at with lunch, along with a few of the roasted veggies I served alongside. This one is definitely going to be a regular. Thank you! Made this for dinner tonight! It smelled amazing while we were making it, and tasted even better! Kids loved it! Doubled the recipe and it was still under 10 dollars. Thanks! I made this and it’s a great and easy recipe. Also my first time making falafel. Your recipes always work out very well for me. I didn’t need to refrigerate before cooking. Made this last night and looooved it! I had a little trouble getting the falafel to stick together when frying, so I may need to add a little liquid…or maybe add less flour? Either way, delicious! Hi Kacey! Either blending them more or adding less flour will help with that! A little tahini can also help them stick together. Hope that helps! I followed the Falafel recipe to the T, however, since there is no binder it fell apart, but I did manage to salvage it. The garlic dill sauce is the absolute TRUTH. I made these and they are unbelievable! SO GOOD! Thank you for the recipe. They are great to take to lunch. These will for sure be on my lunch rotation! These were absolutely delicious. Thanks for the great recipe. My son and his girlfriend are vegans. I am making lots of vegan recipes and this one will definitely be saved in my recipe file. I tried this recipe last week and it is AMAZING. Having had tons of falafel in my life, I can confidently say that it’s up to par with the traditional, deep-fried goodness that you’ll get at an authentic restaurant. It’s a great option for a vegan diet, and will be added to our regular recipes :). Sorry if this has been asked before. Just wondered if you can chill overnight or is that too much time? Thanks! I made these….and the whole time I was SUPER SKEPTICAL (not being a full vegan and all). They were so quick to make I didn’t think they would taste very good. And when I had done a quick taste test in the food processor stage I found the Shallots to be extremely overwhelming. Lo and behold lunch time rolls around and I start cooking. The aroma was intoxicating. I dished out the food to the very PICKY men in my house and all I got was a stunned silence. Then the “HOLY SH**Ts” came and all hell broke loose. Everyone was clamoring for more. Simply amazing. I was even paid to make more!! Thank you thank you, thank you!!! Loved it- super easy and delicious. Love the sesame seeds! I am in LOVE with these! Amazing recipe and so so easy! Made this last night with the dill sauce, major kudos! My son almost ate them all up without anything else, have to fight for my share. These are really good! I didn’t use quite enough flour (only 1 Tbsp, which seemed enough at the time) so the first few fell apart during cooking, but it didn’t matter; the crumbly bits were great for layering into the pita pockets! Hi! Are the finished disks supposed to be a little doughy? Or does that mean my batter was too wet? I did everything by your instructions. :-/ they taste wonderful though! And your garlic sauce is AMAZING! I just made this today and WOW! The garlic dill sauce was to die for honestly! Just made these and they are even better than the deep fried falafels I get from my favorite greek place. I will definitely be making these all the time now. Love these! The ratio of ingredients was perfect – they held their shape very well. I don’t like falafel. Every time I’ve had it, it just tastes bland and unappetizing. This recipe changed my mind! Thanks again for another wonderful recipe! Just made these last night they were amazing! Simple ingredients with so much flavor. I also made the sweet potato and the garlic sauce all of which were a hit! Amazed to find a recipe this easy! So many use soaked uncooked beans, who has that just lying around? Thanks so much. Do you know if this recipe is gluten free too? I’ve been wanting to make my own falafels ever since I had a falafel sandwich at Falafel Guys before I turned vegan, this recipe makes it look pretty easy to make. By the way I’ve been loving your recipes so far, all the ones I tried have been really good! Just made this falafel recipe for the second time–I’m obsessed (and so is my omni boyfriend)! Super tasty, not to mention quick and easy, which is a huge plus for an inexperienced cook like myself. Very excited to branch out and start making some of your other vegan recipes! Thank you for this! This was my first time making falafel and your recipe turned out great here. We had 15 pleased guests at dinner. Thank you. Just tried this recipe. It was my first time making falafel and I’m quite satisfied! One question though, I did end up getting more of a paste than a crumbly dough, and thus had to use a lot of flour, thereby losing some flavour. Could it be because I used a white onion instead of chalots? I also used a hand mixer instead of a blender, because I don’t have one. What would you recommend in the future? We’d recommend using a blender or food processor and adding flour if need be! Has anyone omitted the oil and baked these? I try to really avoid oil and I love falafel. I used 3/4 cup onion for this, added some garam masala for something different, and coriander powder. The end result was totally delicious, but I was worried when blending because it quickly became wet/mushy. I added 4 tablespoons of flour but even then it was mushy/wet. I added another tablespoon and then didn’t want to add anymore. I put it in the freezer actually for like 30 or 40 minutes. When I took it out it was stickyish but I used panko crumbs and did like you said on the skillet and they came out superb. We put ours in a chapathi with homemade hummus, lettuce, tomato and jalapeño. This was great, thanks! I consider myself talented I in the kitchen & have worked in various restaurants & ive got to say, these falafels completely fell apart. made the mistake of deep frying, they simply disappeared in the oil. tried frying in a sauté pan, way too delicate. disappointed, keep looking. Loved this recipe so much! Have to admit I added about 1/4 egg as a binder so I didn’t stay totally vegan. Also- try flax seed instead of flour- it really worked well and adds another layer of flavor, too. I honestly could eat these everyday, they are just that delicious. Thanks so much for the recipe! This recipe looks amazing! The only question I have is if I save some mixture for another day, will keeping it in the fridge too long make it too tough to mold? No, that should work! Up to a few days. You’re gonna think I’m crazy, but one of the characters on last night’s episode of “The Walking Dead” was eating falafel, and I’ve been wanting some all day!! Found your recipe on my smartphone while I was standing in the chickpea aisle at the grocery store after work, and I made these. They were dee-lish & so easy to make! Husband loved them too, and he asked if I’d make your recipe more often!! Thanks for my tasty, easy dinner!! Ha! Thanks for sharing! So glad you enjoyed these, Diana! I can’t wait to try this! I have time to put it together tonight but I want it for tomorrow’s dinner. Do you think it would be fine to sit in the fridge overnight instead of just 1-2 hours? I’m so happy to find this recipe and your sweet potato one. I order falafel out whenever I can but haven’t thought to make it myself. I sent my husband to the store for sweet potatoes to make that meal later in the week. Thanks! That should work! Hope you love it, Karen! I made these with my kids and they were so good and easy! Thank you for a great recipe! I live in Mexico and crave foods you can’t find around here. Made my own garlic tahini sauce with sour cream and some fresh herbs, and used these local herb wrap tortillas to make falafel wraps, but I was also just eating the little patties with the sauce and chile, so good! Would actually be a good canape too. New to being vegan and this was one of the first things I tried making myself. And omg yasss. The sAuce is way to damdamn good! Ha! So glad it worked. Thanks for sharing! This a very easy recipe with one problem…. it doesn’t work!! Taste really good but barely stick together. Worst Falafel ever. I had no problems wi th this at all. How long did you llet the falafel mix chill for? What’s the point of introducing us? They’ll be gone so soon – it’s barely worth it! Do you have any recipes that use uncooked chick-peas? I’ve always assumed the flour only acts as a binder and adds no flavor (but unnecessary calories). Also, the link to your garlic-dill sauce leads to Mediterranean baked sweet potatoes. While those *do* look delicious, I would be most grateful if you could provide the sauce recipe as well. Just saw that the potato recipe lists the sauce recipe. Derp! I tried to make a double batch of these and they looked delish until I accidentally added too much flour. I have them setting in the fridge, any suggestions to fix it so I won’t have to throw the whole lot away? Hello Dana, I think I just found the best falafel recipe ever :) I can’t wait to make them for my family. I tried once from other source, but it was an oily dissaster :( and then I just gave up & bought at the store…Thank you ! I have NEVER has falafel add good add this and I even bought falafel spice once to try to perfect my recipe. I know it is a while later and you will not respond but major kudos on a fabulous falafel recipe that is now a family favorite!!! I just discovered your internet page a few days ago and have already tried a few recipes and I’m impressed, they are just fantastic!! I am really looking forward to trying these falafels ( tomorrow! ) and I especially love the fact that some recipes, like this one, have conversions to grams. Thank you for sharing all these amazing recipes! I left out the breadcrumbs and added Ener-g Egg replacer.. maybe it was too moist because something was just off. Made this last night for dinner and wow, I was very impressed! I used fresh cilantro and a touch of mint instead of the parsley. I also added cayenne pepper and some extra cumin and coriander powder for more taste. I ultimately used about 5 Tbs of whole wheat flour. This is definitely going into the dinner (and lunch) rotation. Thanks for a great recipe! Thanks for sharing, Seema! Glad you enjoyed it! I have to say, I fiddled with this recipe because I was in a rush, had to use dried parsley vs. fresh (I know, bad) and it was still good. So I think it unfair to downgrade it to 4 stars for not following the recipe so I give it a 5. I also had issues with my Vitamix and the “batter” being trapped at the bottom and not getting the chickpeas fully “batterized”. I’ll fiddle with that too. Grapeseed oil was perfect choice though, thanks. I am not sold on the garlic sauce. Hummus on top of chick peas on top of lemon. Needs contrast or something. I think I’m gonna top mine with a vegan avocado aioli. This is the best falafel I’ve ever had, and I eat falafel regularly. Amazing recipe! The sauce was delicious as well. Thanks! I literally just finished making and eating this recipe and I can honestly say this is the best falafel I’ve ever had/made. As someone who is starting their vegan journey this makes me very excited and happy to continue. Ah, thanks Victoria! So glad you enjoyed them. Best of luck! So great! Glad you enjoyed it, Heather! Falafel takes a little practice, but I get better with every try! Liked these! Nice and crispy on the outside. The sauce was perfect. Just found this blog three days ago and got so excited! I made these tonight for dinner with the garlic sauce, And my whole family loved them! I also made the hummus and the date Carmel! I made an Iced chi tea by blending the date Carmel with cashew milk cinnamon and 4 ice cubes! Thank you so much dana for sharing these recipes! There delish! So great! Thanks for sharing, Lauren! Glad everyone enjoyed them. Tried this recipe out last night as a friend was coming for dinner and everyone loved it (including my VERY picky boyfriend). I would highly recommend adding the panko as it does give the falafel a very nice crunch. I made the MB microwave hummus (I added a ton more lemon! ), and then the dill dressing (I doubled the recipe and had a little left over). We topped our pitas with greens, tomato, cucumber and onions as well. Very delicious, not a difficult recipe, and definitely worth a try. I will remake this and freeze falafel for a quick veggie meal! Love so much that it’s not just from a box!! Ah, nice! So great everyone (including the BF) enjoyed it! Thanks for sharing, Christine! ah, I haven’t tried that yet! But I hear I need to! I made this recipe last week and loved it! Super simple and bold flavors. I was just looking through recipes to make for dinner this week, and I think this is going to make the list again. Falafel is easily my go to comfort food when I actually want to feel as good eating as I do afterwards. Love! mine were mushy on the inside. Can’t locate the garlic-dill sauce anywhere on this websight. I will try this at some time. And I have to add a comment regarding dried beans. They’re terrible. I use canned ones. Much easier to handle. Thanks for sharing, Gabi! Yeah, the dried bean method weirded me out! And, very time consuming. Has anyone tried it? I would love to make these GF! I am making these now… I cooked my own beans, however, and the parties seem to be dry. Do you think adding a little oil or water would help hold them together? I do! Start with a little oil, then add water. Never had falafel before, so I made this last night. It wasn’t what I expected…it was even better!!! This will be our new quick to-go dinner. I made a couple of substitutions with what I had available, but it was still so yummy. Thank you so much for this quick and delicious recipe! Wonderful! Thanks for sharing, Hannah! Thanks for the great recipe! I like this one more than the last falafel recipe you posted. I blended everything together the night before and made them during my lunch break. Such a tasty treat! Thanks Lizzie! I agree! Glad you enjoyed it. I want to freeze and make these for an up coming camping trip! Do you think they would work best to cook as instructed and freeze or to par bake them at 350 F for 10 min or so and then freeze? To prepare them while camping I plan to grill them. Either way. I’d say freeze them par-baked so they have better flavor! haha, I am a bit obsessed. Hope you love these, Sarah! Ahh… I have never tried making falafel before.. Guess I am spoiled for choices with falafel the place i live.. but i cant let this one pass me.. loving this recipe incredibly.. I love home made falafel, it’s so much fresher and less dry than the ones you get in take-out places. Have to check out that sauce of yours, it sounds delish! Thanks Sofia! Hope you love it! I’ve been on the hunt for a easy falafel recipe for a while now. Ta da – found it! Thanks for sharing this awesome goodness guys! Of course!! Hope you loved these! This looks so amazing!! 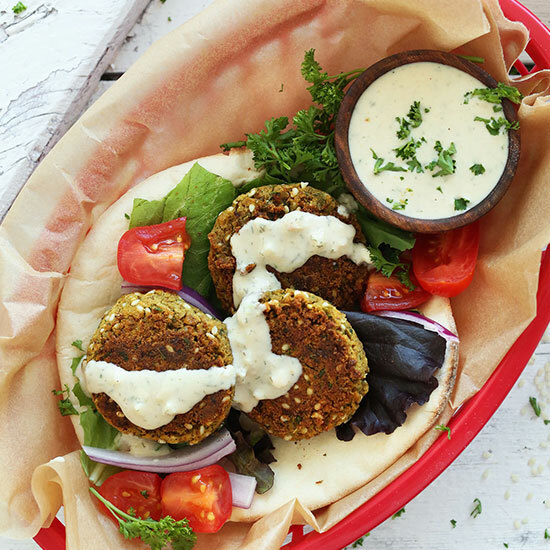 I’ve tried your other falafel recipes many times and loved them so I’m sure this one will be fabulous as well. I can’t wait to give it a try! I have been in love with falafel ever since my college boyfriend/now husband (I wonder if it had anything to do with this crispy chickpea treat?) introduced me to them so many years ago. I have made multiple versions myself, finally found one I’m truly happy with (although I’m still perfecting it before I post), but I think I may need to add yours to the list, looks so good and the sauce, yum! Thanks for working so hard to give us such great recipes!! Thanks Jen! Hope this one meets your expectations! Not sure what I did wrong. My mix is so dry I didn’t bother to add flour. Added some lemon juice to try and get them to stick together. Maybe I dried my chickpeas too much? It sounds like you may have dried the chickpeas too much..
Falafelllllllllsssssss yusssss! These look super healthy and tasty!! It’s like a savory hummus-like nugget. Try it! A perfect recipe for me, I’m lactose intolerant! Your photography is really strong too. Falafels, I could live off them! These look so deliciously crispy without using a fryer which I love; sometimes in restaurants, the falafels are so greasy. Falafels are my FAVOURITE things ever. Seeing this recipe has instantly made my day about a million times better! So glad! Hope you love these! Ohh this looks amazing and really easy to do, I can’t wait to try it!! Do you reckon it would be possible to bake them instead of frying them :)? I tried baking, and they didn’t have as much flavor and were a little harder for some reason. I haven’t had falafel in so long and I have not clue why. Gimme! 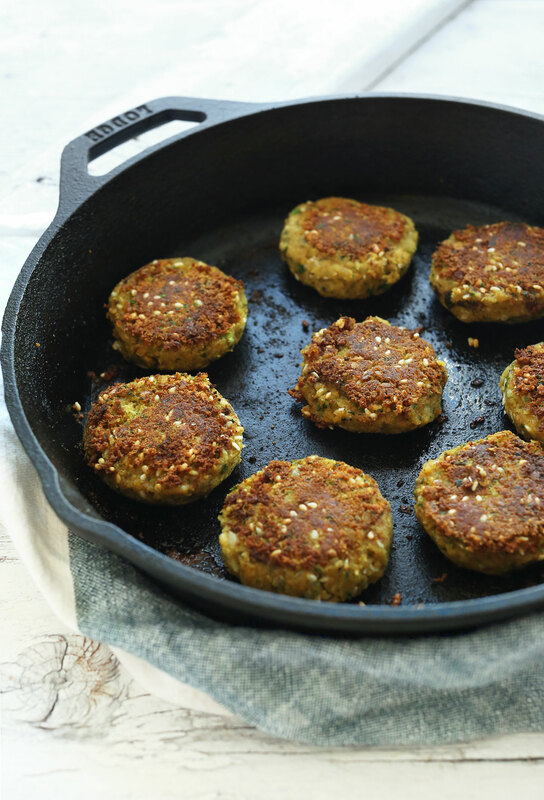 This has got to be the easiest falafel EVER! Yum! YESSSS can’t wait to make this!! Yum.. What a dreamy basket! You seem like such a falafel savant, I can’t wait to give all of your falafel creations a go! haha, best compliment. Hope you give these a go! Thank you! I’ve been planning to make falafel. They look so good with the sauce. Do you have to use fresh parsley, or can I use the ones in McCormick’s bottle? Yuck on the dry ones, but do what you must and try to do it sometime with fresh cilantro or parsley. That door is the most beautiful background! It provides subtle texture and depth for a perfect balanced picture that highlights this dish. Well done! If I could only eat one food for the rest of my life, I’d choose falafel. Seriously. This recipe looks amazing! I love how falafel is so easily adaptable with the spices and herbs you choose. I recently discovered the method of making falafel with dried, soaked chickpeas instead of canned. Thanks for the recipe! Wow! It’s time to try falafel then, never had before!!!! Loving the garlic and shallots in there, so tasty. Wife loves growing those. And the cardamon. That’s so good, such yummy flav. Want to eat this on the beach. Would you make them the same as this?